With the midterm elections behind U.S. President Barack Obama, the domestic political agenda is set for the remainder of his term. But the foreign policy menu is an open buffet, and Obama has a strong opportunity before him as he heads to China, Myanmar, and Australia. The rebalancing or “pivot” in the Asia-Pacific showed great promise during the president’s first term, but as of late it seems to have wobbled as a consequence of an anemic foreign policy. But it’s not too late. The president should make a second, more cohesive attempt at the pivot. So what would constitute “Pivot 2.0?” The United States must take an active role in Asia-Pacific affairs and should forge, or deepen, partnerships that will open new markets. In turn, the U.S. will realize externalities – or spillover effects – achieved through broader market integration yielding both economic and security benefits. To that end, the new pivot must rectify previous deficiencies. Political will, a deepened commitment to the region, and a clearly articulated foreign policy vision will go a long way. All of this will be put to the test during the president’s Asia-Pacific swing. In Beijing, Obama will meet with Chinese President Xi Jinping for the first round of high-level discussions since the June 2013 summit in Sunnylands. As was illustrated at Sunnylands, the cyber warfare issue is one that cannot easily be controlled. While many policymakers would find the pushing on a string position to be an unacceptable starting point, the president should try to break new ground in discussions and not rewind the tape. The issue of the seas, on the other hand, can be controlled and is far more pressing. For the pivot to have bite, the U.S. must take a stand and make clear that national security extends to international waters. Should island disputes careen toward conflict, the U.S. has a responsibility to demonstrate a commitment to regional security through a heightened military presence. China should view this policy point not as a threat, but rather as an opportunity to clarify its offshore intentions. The political escape hatch must remain open for the Chinese government should it wish to recalibrate its maritime policies without compromising political stability. 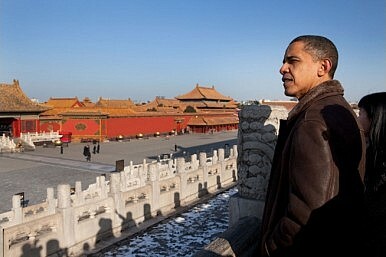 Meanwhile, China needs to resolve – and articulate – what it wants from the U.S. Obama should ask the question. On the ground in Myanmar, Obama will be confronted by a state that has seemingly run out of gas along the reform highway. The country’s historic reforms, which provided an appealing backdrop during the president’s November 2012 visit, have yielded to ethno-sectarian violence and political backsliding. On this front, sovereignty issues constrain the ability of the U.S. to motivate Myanmar’s government toward inclusiveness. There’s a backdoor to reform backsliding, though. By incentivizing American businesses to open small-scale, low-skill manufacturing bases in Myanmar through fixed-term tax rebates, the U.S. can increase its economic footprint in the region. In turn, the U.S. will directly help Myanmar raise itself out of poverty through employment opportunities for citizens, as well as mandatory corporate community engagement programs in the model of Chinese businesses already operating in the state. We’re not talking about digging gold out of mountains or cutting down teak forests. We’re talking about creating sustainable jobs, not short term resource rents. Very quickly, the U.S. will come to be viewed as a country that wants to help and that takes very little in return. For the U.S., the long-term dividends from investing in Myanmar will outweigh the short-term costs as an economic partnership will be secured. This is precisely how it can make a positive impact on humanitarian issues while honoring the ecology of the state. Addressing the G-20 Summit in Brisbane, Obama should deliver the foreign policy vision many hoped would be revealed during the May 2014 West Point commencement speech. Mindful of geography, Australia should also be acknowledged as an invaluable Asia-Pacific partner. As Australia grows its military capabilities, the potential to help sharpen the bite of the pivot, particularly with respect to sea disputes, should not be overlooked. Moreover, the president should use the moment to highlight the benefits of the Trans-Pacific Partnership (TPP). Up to this point, Obama’s work on the TPP has been hopeful, but more can be said and done to help secure support for a partnership that will create new markets for U.S. exports while strengthening security regimes throughout the region. This raises the question: What are the possible outcomes if “Pivot 2.0” is a success? In addition to securing long-term gains through an entrenched regional economic footing, the U.S. will bolster an already strong security community. By moving away from a single-strand economic and foreign policy that draws states apart, and toward a coherent foreign policy that organizes the region by unifying features, the United States will see immediate national security dividends. When structures are arranged around common interests, everybody wins. Paired with a clear communication policy, the pivot is a powerful force for good within the region, both in terms of economic and national security features. Obama knows this. A strong foreign policy will do more to shape a legacy than domestic politics, and the type of foreign policy being advocated here is very much in line with the Great American Century model. There’s no reason why that can’t be the case once again. Reid Lidow is a Gates Cambridge Scholar at the University of Cambridge where he is reading for an MPhil in Development Studies. His research focuses on global development and Asia-Pacific security affairs, specifically with respect to Southeast Asia. The U.S. president has the opportunity to score a number of economic and human-rights legacy achievements.